small insulated cat house featuring PanelAbode Engineered Panel Technology, removable roof, and more! This cat house is designed specifically for cats weighing up to a maximum of 15 lbs. * Like all of our Climate Master Series insulated pet houses, this house features our PanelAbode laminated engineered panel technology, a thick layer of true foam insulation, our Slide-Lock removable roof system, and a host of other popular features for the ultimate comfort and protection of your pet. 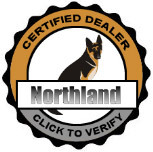 Our engineered panel construction is superior to plastic houses as well as traditional cedar, pine, fir, and plywood dog houses. 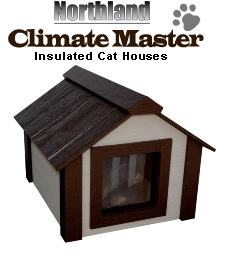 Climate Master cat houses are extremely resistant to moisture and insects, are stronger and more scratch and dent resistant, and far less likely to warp and/or crack than competitors' materials. * Weight recommendations for cat houses are estimates only. Please check house measurements to ensure an appropriate size. Panel-Abode Engineered Panel System - simulated rough-sawn cedar finish - stronger, more durable and more dimensionally-stable than traditional cedar cat houses, with superior scratch, dent, warp, moisture, and insect resistance!